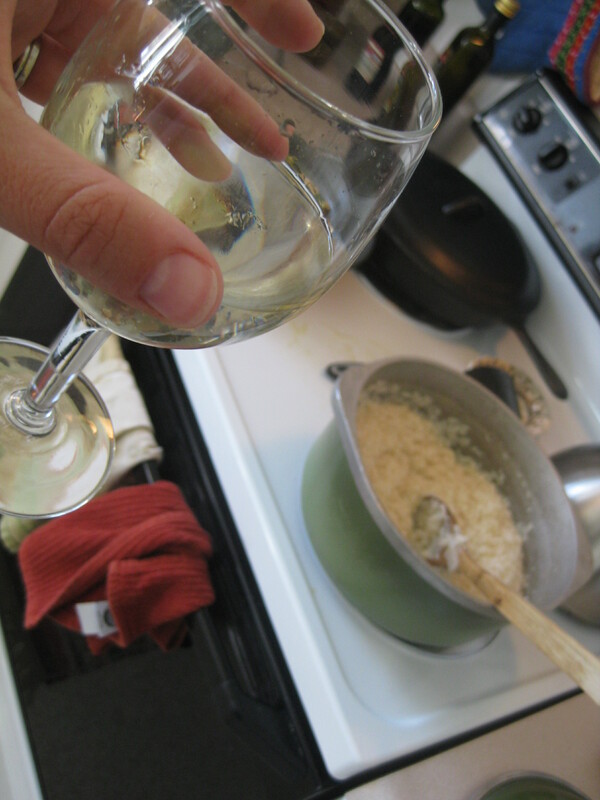 As soon as I read Bread and Wine, I knew I had to try the risotto. It sounded like a fun, delicious challenge. And it was! Now she’s right, plan on spending time in the kitchen. 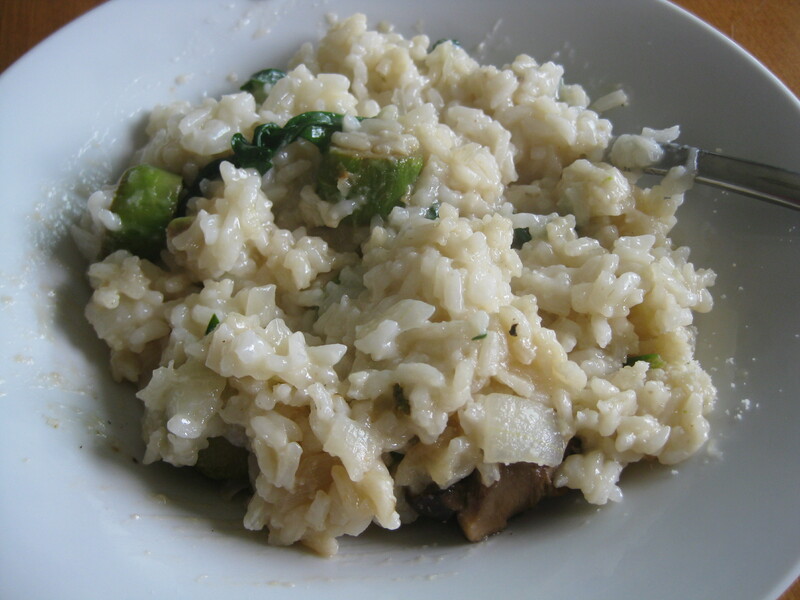 Risotto isn’t something you can set and forget. You have to stir and check, and then check again, and stir again. That’s not to say you’ll spend your evening tirelessly stirring a pot. You won’t. You just can’t leave the kitchen for about an hour. So pour yourself some of that wine you’ll use, and make this risotto. 1. In a large pot, heat your chicken broth. If you don’t have chicken broth on hand, 6 cups of water and 6 tablespoons of olive oil will work well as a substitute. 2. In a large stock pot or dutch oven, drizzle some olive oil–you want a thin layer on the bottom of the pot. Heat the oil on medium heat, then add the onion; after 2 or 3 minutes, add the garlic. 3. When the onion is translucent, add the rice. Stir it until all of the rice coated with oily goodness. After it’s coated, add the wine. Once the wine is absorbed, add 1 cup of your warm broth. Stir! 4. Now, your main goal is to keep the rice from drying out. On the flip side of drying out, you don’t want it to be drowning in liquid either. When the risotto appears to have absorbed the cup of broth, add another cup, and stir. Regarding the heat of the stove, you want little bubbles to surface periodically, but you don’t want it to be boiling. Turn your stove up or down accordingly. 5. Periodically taste it along the way, and add what you think it needs. A little salt? More garlic? 6. When all but one cup of broth is used, heat the butter in a frying pan. Once the butter melts, add the asparagus. After 3 or 4 minutes, add the mushrooms. 7. While step 6 is happening, add the last cup of broth, and allow it to absorb into the rice. When it’s done, add some Parmesan cheese based on how much you like Parmesan, as well as some pepper. 8. Remove from heat, mix in the asparagus, mushrooms, and spinach. The heat of the risotto will wilt the spinach perfectly! 9. Serve with a bit more Parmesan sprinkled on top, as well as a bit of cracked pepper. Serve a big, heaping bowl as a main dish, or smaller portions with an entree. Enjoy!